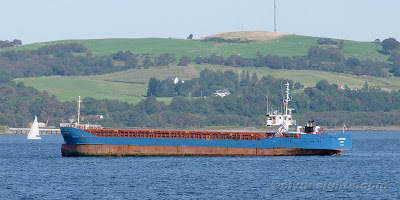 The low airdraft coaster BALLYHEALY arrived at the 'Bravo' anchorage very early on Saturday morning from Ayr, and moved upriver later in the afternoon to Renfrew to load scrap metal. She had been a member of the Strahlmann fleet until December 2007 when, as their HUNTER, she was sold to an Irish company called KQ Shipping, and given her present name. She was built at the Sietas shipyard in 1981 as DEIKE, retaining that name until 1998. BALLYHEALY is 2,820 tonnes deadweight and 88.0 metres in length.